Read the post headline again, but this time picture Jan Brady of The Brady Bunch whining "Marcia, Marcia, Marcia." Stuck in your head now isn't it. Sorry about that, but the post needed to lodge in your brain - not in a whiny way, mind, but in an excited, can't wait to get it in your mouth way. Canadians love their 'za. We can't get enough of it. Just a couple of nights ago I had a serious craving for pizza. Since I couldn't fly to New York (I wish) for a slice, I went online to research local spots in Toronto (along with delivery), and while I was at it, do a general inquiry of exactly how much pizza Canadians have consumed this past year. According to this statistics paper, as of 2013, 95% of Canadians ate pizza at least once a month. What's even more interesting, is the changing demographics of pizza eaters. Whenever you see advertisements for pizza, it usually includes teenagers, young families or groups of people from their 20's to mid 30 year olds. This demographic is incredibly important to pizza makers, but according to pizza magazine - yes, an online magazine dedicated to pizza exists(! ), pizza is growing in a demographic that usually shuns foods that provide zero nutrients and are all filler. As the baby boomers head into their later years, the foods they ate when they were younger are following them, accounting for the growth in that particular demographic of pizza eaters. And there are so many options now then ever before. Artisanal, gluten-free, whole wheat, thin or thick crust, vegetarian - the choices are becoming almost endless, and it is a strong reflection of the changing yet growing demands on an industry that is happy to change with it's customers. I know within my own demographic, 40+, what used to be so good in my 20's stopped being quite as tasty as I got older. I began to shun certain brands of pizza, be it frozen or fresh, because in my mind they simply did not qualify as 'pizza' - more like ketchup on a cardboard box. Turns out I was wrong - again, about this. THG (introduced here) was once again instrumental in showing me the errors of my ways. He baked a frozen pizza. I ate frozen pizza. There, I said it. I ate it, I enjoyed it and if push comes to shove when there is no other pizza option, I will do it again. Of course, very few things really ever tastes as good as fresh, so my good friend Brad kindly passed on a home made pizza recipe (using an iron skillet!!!!! Clearly that excites me! ), and I am very happy to pass this rather simple, but tasty recipe on to you my fellow reader. Check it out for yourself. And when you've finished making it, and it's piping hot out of the oven, give yourself a congratulatory drink of champagne or a dry prosecco. Why? Because champagne goes with everything. Or you can just have a glass of Coke or water. Additional olive oil for frying dough at medium heat on stove top. Note: the baking soda and dark ale/beer is used a yeast replacement! 1.Prepare chopped tomatoes first, and let sit on paper towel to remove excess water. 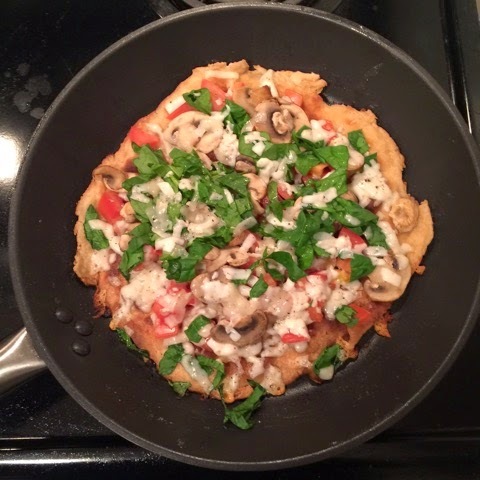 2.Wash, dry and chop spinach or basil; shred cheese; dry fry sliced mushrooms. 3.For dough, mix dry ingredients, then add 1 Tbsp. olive oil and up to ½ cup of dark ale, and combine into tight dough ball. Divide into two equal pieces, and set aside to let rest for 10 minutes. 4.Roll out dough on a lightly floured surface. You might need a little more flour to do this. 5.Heat about 3 Tbsp. of olive oil in skillet (pan) on medium heat until oil almost smoking. It’s important not to heat any higher than medium, to avoid burning the crust. Put one rolled-out crust in the pan and fry, using a fork to lightly puncture crust when air bubbles form. Fry until crust is a light golden brown. About 3-4 minutes. 6.Flip the crust, bringing the light golden brown presentation side to face up. While the other side is browning, adjust heat lower if necessary. 7.Add shredded cheese, then chopped tomatoes. Add some more cheese, then mushrooms and chopped spinach/basil. Add another few sprinklings of cheese. Add some black pepper to taste. Cover skillet, and let cheese melt. Be careful to regulate heat to avoid burning bottom of crust. 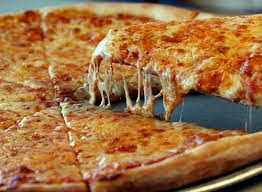 8.Once cheese is melted, the pizza is ready to eat. Follow the instructions above to make the second pizza. Note: The toppings used for this recipe is just a suggestion. If you have particular favourite pizza toppings, substitute the ingredients and adjust the recipe accordingly.